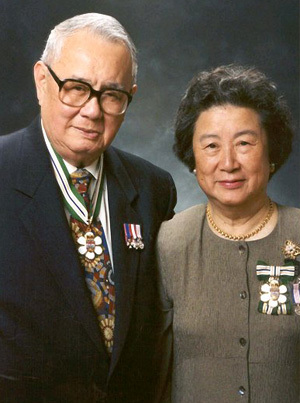 One of British Columbia’s busiest couples, both in the private and public lives, David and Dorothy Lam have together committed themselves to an extraordinary career of philanthropy and public service. The philanthropic work of the Lams is legendary. Their generous support to educational and cultural projects will be lasting tributes. The Lam tenure at Government House left many legacies for the Province. The most visible, of course, is the beautifully restored public gardens – a true labour of love. But their championship of intercultural harmony and promotion of the traditions of volunteerism will benefit the province for many years to come. The team work of the former vice-regal couple is well-known in the Province. Whether welcoming Her Majesty The Queen during the Commonwealth Games, or Chinese Vice-Premier Zhu Rongji, the Lams have always succeeded in advancing the interests of our province and its people. British Columbia has been fortunate to have had in this ceremonial position two individuals who, through their personal warmth and actions, have set an example of tolerance and understanding of cultural differences.